You can use the domain forwarding to redirect your domain names. Click Manage Domain Forwarding under the Domain Settings section. From the Type drop-down menu, you will need to choose which type of redirect to setup. Temporary (302) – a temporary 302 redirect will redirect your visitors and search engines, but it will not update your visitors bookmarks and search engines will continue to index the original website. From the https?://(www.)? 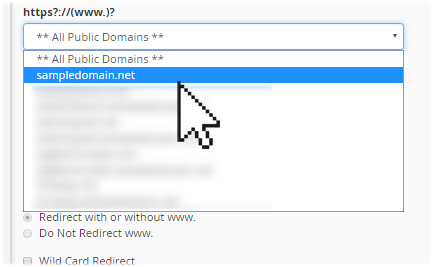 drop-down menu select the domain name you want to redirect. Enter the full URL of the destination page in the Redirects to field. If you want to redirect to the same file on the destination URL, then check the Wild Card Redirect option.